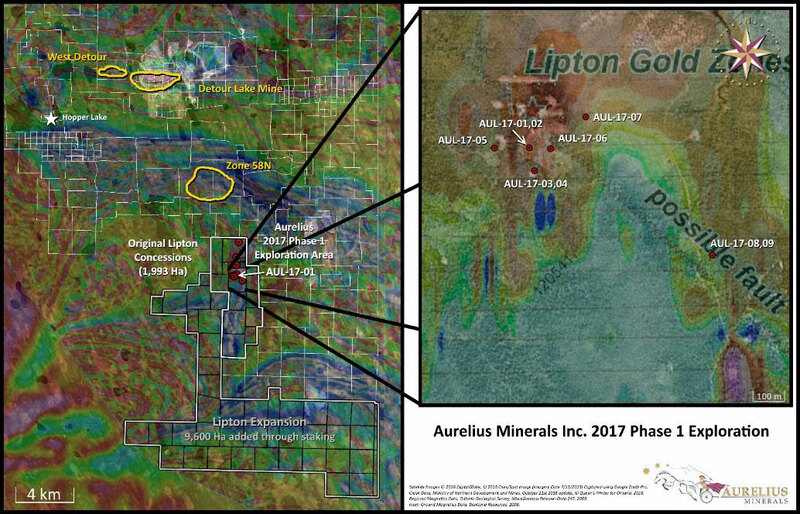 Vancouver, BC - Aurelius Minerals Inc. (TSX.V: AUL) (the “Company” or “Aurelius”) is pleased to announce additional assay results from the recently completed Phase One 2017 exploration program on the Lipton Property. Results from seven of twelve holes are reported here. All seven holes intersected gold mineralization. Results from the remaining five holes are pending. The property is located directly adjacent to the Detour Gold property and 4.5 km south of their 58-N discovery. “Intersecting near surface gold mineralization in all seven holes is very encouraging and, we feel, indicative of an extensive gold system” stated Mark N.J. Ashcroft, P.Eng, Aurelius President and CEO. “These results are exciting for our team and open up potential for additional gold mineralization at Lipton. Plans are currently being made to get back on the ground to carry out the next phase of exploration early in the new year” continues Ashcroft. Aurelius previously announced partial hole results of hole AUL-17-01 on September 11, 2017. The program included a total of 1,833 metres of NQ core drilling in 12 holes from 9 distinct platforms and a deep looking ground induced polarization (IP) survey covering 11-line kilometers. The primary goals of the maiden program were to confirm our interpretation of the local controls on gold mineralization, to test a number of new targets based on previous drilling and geophysics and to generate new targets to the north of the main Lipton target. Table 1: Gold intervals from first 7 of 12 holes drilled in Phase 1 program at Lipton. Results are not capped and may not represent the true width of the mineralization. The mineralization encountered in this drill program suggests that the Lipton gold zone extends beyond the Contact Zone between intercalated mafic volcanics/sediments and felsic tuffs as historically interpreted. Other intrusive units, such as feldspar porphyry, yielded anomalous gold, and there appears to be good structural control on the mineralization. 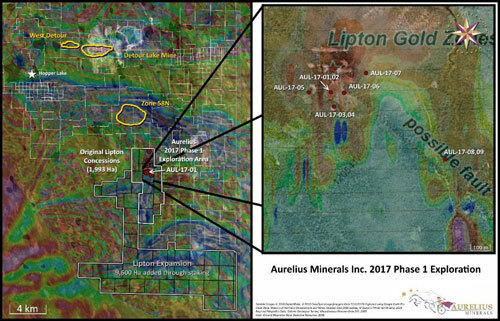 The gold mineralization intersected in holes AUL-17-01 through AUL-17-06 are from the interpreted central portion of the Lipton target. Hole AUL-17-02, the interval at 144.5 metres opens up new potential at depth; historical drilling at Lipton is relatively shallow with most holes being less than 150 metres long. Hole AUL-17-07 was drilled at the nose of the interpreted fault and to the north-east of the first six holes. Remaining holes were testing the eastern limb of the fold and new distinct targets to the north of the fold. Aurelius is also pleased to announce the appointment of Jeremy Niemi, P.Geo, to the position of Vice President, Exploration for the company. Mr. Niemi is a geologist with over 20 years experience in the mining/resource industry, at both corporate and operational levels. Mr. Niemi was most recently the Vice President, Exploration for GoldQuest Corporation and the Director of Exploration for Aurelius on a consulting basis. During his tenure at GoldQuest, Mr. Niemi led the advancement of the Romero project from an initial inferred resource of 300k ounces AuEq, to a prefeasibility study, a $23-million investment from Agnico Eagle and a current mineral reserve and resource of 2.5 million ounces AuEq. Prior to joining GoldQuest, he served as Vice President, Geology with Noront Resources and before joining Noront he was Manager, Technical Services, for Kinross Gold Corporation. “We have had a fantastic start to the exploration with Aurelius and I am excited to play a larger role as we kick-off the next phase of exploration. With our initial success at the Lipton project, I now believe there is a lot more gold there. I’m also looking forward to working on expanding the gold mineral resources at the Mikwam project”, stated Mr. Niemi. Aurelius also advises that it has retained the services of Hybrid Financial Ltd. (”Hybrid Financial”) for strategic investor relations activities. The initiatives include marketing and investor relations services for the Company. Pursuant to the agreement Hybrid Financial will receive a monthly fee of $14,000. The agreement commenced October 25, 2017, for an initial term of three months, following which the agreement may be renewed by the Company on a month-to-month basis. The agreement is subject to the approval of the TSX Venture Exchange.